You probably have a cousin who is so close to you that you consider her your own sister. If so, then you must have cherished all the memories that you share with each other since childhood. Your cousin sister may be celebrating her birthday today. If you want to make her feel how special she is to you, then send her the most wonderful birthday wishes. 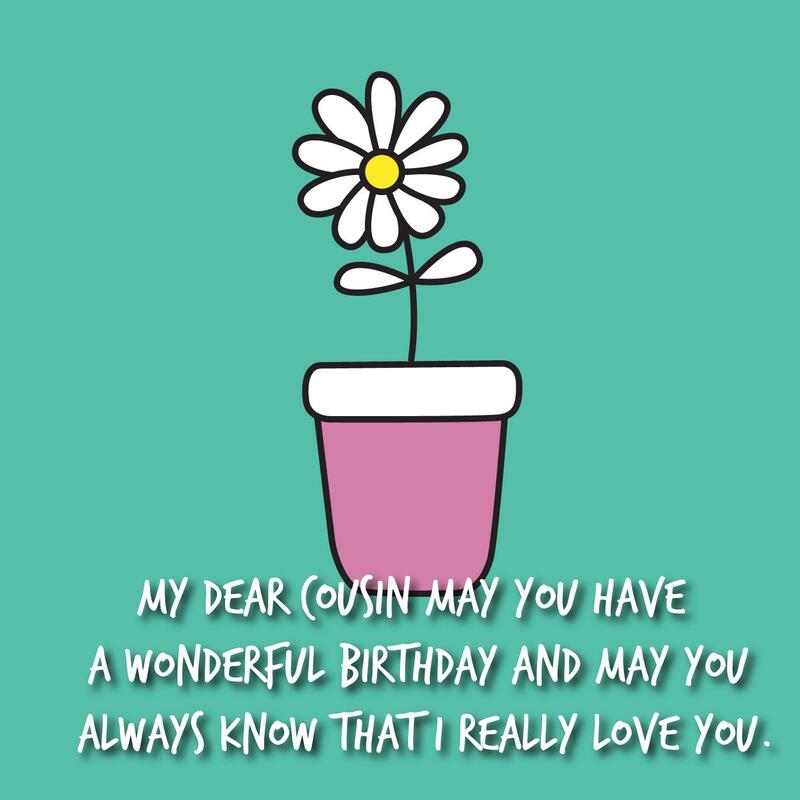 If you need ideas for birthday wishes, then here are some birthday wishes for your cousin sister that you can check out. Choose something that perfectly describes the kind of relationship that you have with each other. Happy birthday my dear cousin sister! Fate and destiny may have decided that we’re going to become cousins, but we have proven them wrong by becoming the best of friends! Meaningful silences, dark secrets, and embarrassing moments! These are some of the most valuable things that we share aside from the DNA and genes. Have a wonderful birthday to you, my dear cousin sister! You’re certainly the best cousin anyone can ever wish to have! You always cheer up whenever I feel so lonely and you are always there when things are tough for me to handle. Happy birthday to you! I love you so much! Cousins may be related by blood but they are best friends by heart. They are like siblings who share secrets and will always support each other no matter what! Happy birthday to you my dearest sister! A cousin sister is someone who is going to tell me not to get drunk, yet always invites me for a drink. She’s someone who brings out the best in me and would correct me if necessary. Happy birthday sis! I love you so much! Happy birthday to my very smart cousin sister. Because of her, I no longer need to rely on video tutorials and search engine just to learn things! I’m glad that you’re not really my real sister. Otherwise, my parents would have been prouder of you than to me that will stir jealousy in me! I’m kidding! Happy birthday to you my dear sister! All my life, I’ve always longed to have a sister who can play dolls with me and to whom I can share some of my secrets! I’m glad you came my dear cousin! Happy birthday to you! Your friends might betray you and your boyfriend might consider leaving you. But always remember that as your sister, I will forever be here for you! I love you so much my dear cousin, happy birthday! I feel like destiny has made a mistake for allowing us to be born on different parents. Yet, it made up for the mistake by bringing us together as the best of friends! Happy birthday to you my sis! The secret to making my real sister jealous is on spending more quality time with a wonderful cousin like you! Happy birthday my dearest sis! You’re my antidote for an irritating friend and a cheating boyfriend. Thank you so much for coming into my life my dear cousin sister! Happy birthday to you! Destiny really has some serious taste by choosing you to become my cousin. Happy birthday to you, my dear cousin sister! I love you so much. May all your dreams and wishes come true someday! You are my cousin by blood. However, I also consider you my best friend in life. Thank you so much for coming into my life and for being there to me when the times are rough. Happy birthday sister! People celebrate Mother’s Day and Father’s Day. But I truly believe that there should be a Cousin Sister Day! That way, we can commemorate the presence of an amazing cousin sister like you in our life. Happy birthday! When life will deny you of great friends, it’s going to make up to you by giving you an amazing cousin who can act like a real sister as well. I’m so lucky to have you in my life! Happy birthday to you my dear! We may be related to each other by blood. But we are connected to each other through our hearts! Happy birthday my dearest cousin who is also like my own sister! Happy birthday to my dear cousin who treats me like her own sister! In fact, even a real sister cannot fill in the role she played in my life. As the only child, my life would have been miserable if not for the love of a cousin like you who treat me like her own sister! Happy birthday to you my dear! May God grant all the desires of your heart! I already told my parents that if they have plans to give me another sibling, they should make someone exactly like you! Happy birthday my dear cousin sister! You have all the traits that I need for in a real sibling! There’s nothing warmer and cozier than having your cousin sister to cuddle you on a chilly winter afternoon! Thank you my dearest cousin for always being by my side through the good times and the bad. Happy birthday! Happy birthday my dear cousin sister! My heart would have been empty if you’re not here beside me. Thank you so much for coming into my life! My dearest cousin, you’re like a real sister to me except we don’t fight too often like most real siblings do! Nevertheless, I wanted you to know that I love you so much and I will always be here for you no matter what! Happy birthday! Perhaps the reason why my parents did not think about having another child is because they knew that I have you to take care of me. Indeed, you have been a great sister to me, even when we’re only just cousins! Happy birthday! Happy birthday to the most beautiful cousin in the world whom I treat like a real sister! Thank you for everything my dear. You certainly made my life so much happier! We may be cousins but to me, you’re my sister and a best friend as well! Thank you so much for always listening to my crazy stories and for making sure to keep our secrets! You’re truly the best! Happy birthday! The word cousin does not exist in my dictionary because I only know of a sister or a best friend and that is what you are to me. Happy birthday sweetie! My dearest cousin, how I wish my parents have adopted you so I can have you as my real sister and we can live in the same home and share a room! You’re such a joy to have and I thank God everyday for giving you to me. Happy birthday! Even though we have different mothers, it seems like you’re my real sister! You have been with me through thick and thin and you never judged me despite my weaknesses. I love you so much, happy birthday to you! You’re the kind of cousin who can put real sisters to shame! You’re always there for me when I need you and I couldn’t thank God enough for having you as my cousin. Happy birthday to you! Regardless of how far we are yet to go with life, our childhood years will always bring us together. Happy birthday to you, my dearest cousin sister. I love you so much! Cousins are like siblings but without the fights. That’s how you are to me – you’ve played with me when we’re young and you have shared all your secrets to me! Luckily, we never had a fight! Happy birthday! We may not mingle with each other too often but I know deep in my heart that you’re the cousin that I can always depend on. Thank you for everything my dear cousin, you’re truly the best friend I have. Have a happy birthday! Even though we’re not born to the same parents, we’re more than just siblings and that’s something that I am really proud of. Happy birthday my dear! We both grow up together holding a promise that we’ll never be apart from each other and I’m so happy that we get to keep that promise even when we’re already adults. Happy birthday to you, my cousin sister! Happy birthday to the cousin who considers me as her best friend! I’m truly flattered when you told me that I’m the best friend you never had. My only wish is for you to achieve all the things that your heart desires! Happy birthday to a great woman who I look up to in everything in life! Thank you my dear cousin for being my inspiration. Keep on going the great things you are doing! Happy birthday to you, my cousin sis! You’re sweet, kind, charming, and smart! In fact, you are almost perfect and I’m so happy that we don’t only consider each other as cousins, but as best friend as well! Sending the best birthday wishes and lots of love to a dear cousin who is also my best friend. You may be several years older than me, but I’m glad that we agree on a lot of things! Happy birthday! Happy birthday to you, my dear cousin sis! It’s your special day today so embrace it with all your heart! But of course, don’t forget to make a wish and blow the candles on your cake! We might only be cousins but I never think of you as that. For me, you’re my real sister and the best friend I never had! Happy birthday to you my dear! Enjoy your day! Have a wonderful birthday to you my dear cousin! May you have a blast on your birthday today! You truly deserve to be happy because you always bring happiness to the people around you. I love you so much! Hey cousin! It’s finally your birthday today and I cannot wait to celebrate tonight! So get a lot of sleep because we’ll drink all the booze and dance until the morning! Happy birthday to you, my dear cousin sis! Today is a truly special day for every one of us who loves you so much. Happy birthday to you dear cousin sister! I hope we’ll be best friends for life because I can’t imagine my life without you in it. Hey cuz! Happy birthday to you. Please know that even though we’re no longer kids and that we don’t get to play too often anymore, you’re still very special to me. Thank you so much for all the wonderful memories you shared with me! Best birthday to an awesome woman like you! You don’t only treat me like a cousin, but a best friend as well and that’s something I really love about you. Happy birthday to you! 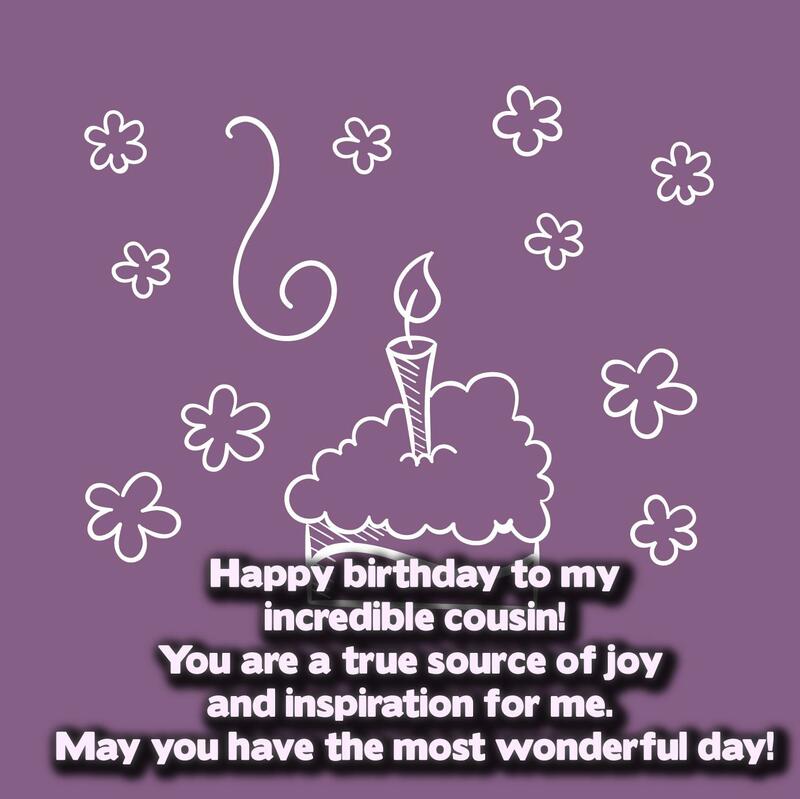 Have a wonderful birthday to you my sweet cousin! Thank you for all the support you have given me. Above all, thank you for making me feel better during those times when I feel like my world is shattered. Happy birthday my dear cousin! True friends are rare to find and I’m so glad that I find that in you. I love you so much! Happy birthday to you my cousin sister! Thank you for bringing so much happiness into my life. In fact, just seeing you smile is enough to brighten up my day! Happy birthday cousin sis! May you always be beside me not only during the good times but also in the bad times! You’ve been a great blessing to me. Thank you so much! 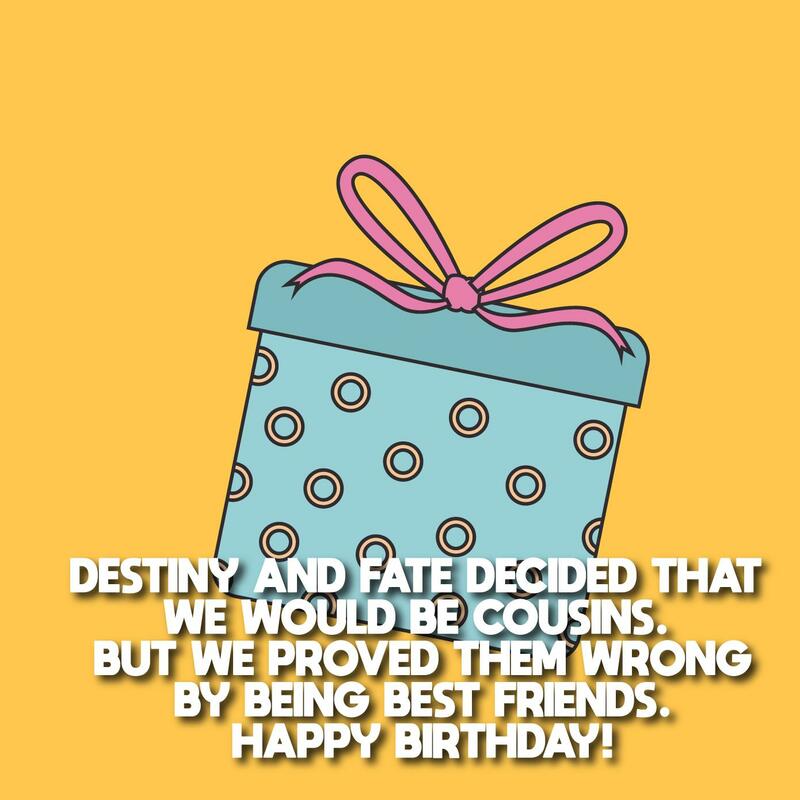 My dearest cousin sister, here’s wishing you a day filled with happiness, great friends, lots of laughter, and loads of presents! May you have a very happy birthday! I love you sweetie! Happy birthday, my dearest cousin! I think I’ve already told you this before but I’ll never get tired saying this to you over and over again – I love you so much and I will always be here for you! Cousins are like siblings, but to me, you’re my best friend as well! Thank you for everything my dear cousin sister! Happy birthday to you! My lovely cousin, happy birthday to you! Thank you so much for always making me feel loved and special. You’re truly God’s gift to me and I just want to wish you the best on your birthday! Happy birthday cousin sister! It’s your birthday and it calls for a one big celebration. You’re truly awesome and you only deserve nothing but the best! Happy birthday to you! My dear cousin sister, happy birthday to you! I only want you to be happy today because you truly deserve it. There’s nothing more special than your birthday my dear cousin sister. So happy birthday to you! My dear cousin sister! We grew up together and we know each other so well. In fact, it seems like you’re my real sister! Thank you for being a shoulder to cry on. Happy birthday to you! I’m really glad God chose you to be my cousin sister! You’re such a great sister and a wonderful cousin as well. Happy birthday to you! Please know that I really love you! On this birthday of yours, I just wanted to let you know how much I truly admire you. You’re a wonderful person inside out and I am so blessed to have you as my cousin sister! Happy birthday cuz! Each birthday brings us a new page of life. On your birthday today, I just wanted to fill your pages with happiness and love! I love you so much dear cousin sister! Happy birthday! Congratulations on your special day, my dear cousin! May God grant all the things you have been wishing for in life! Please know that I’ll always be here for you no matter what! No matter where you are or what you choose to do, I promise to always be there for you. That’s how I love you my dear cousin sister! Happy birthday! Happy birthday my dear cousin sister! It’s time to open the champagne and drink as much as we can! Enjoy this day because you truly deserve it honey! I cannot imagine family gatherings without you my dear cousin! In fact, my life would have been so empty if you were not beside me. Thank you so much for everything that you’ve done for me. Happy birthday! Happy birthday my dear cousin sister! It’s hard to come up with a birthday wish for you because you’re truly special just the way you are! Enjoy your special day sis! I am glad I have you as my cousin sister! You’re so awesome my dear sister and I’m so happy that we also treat each other as best friends. Thank you so much for always making me feel loved. 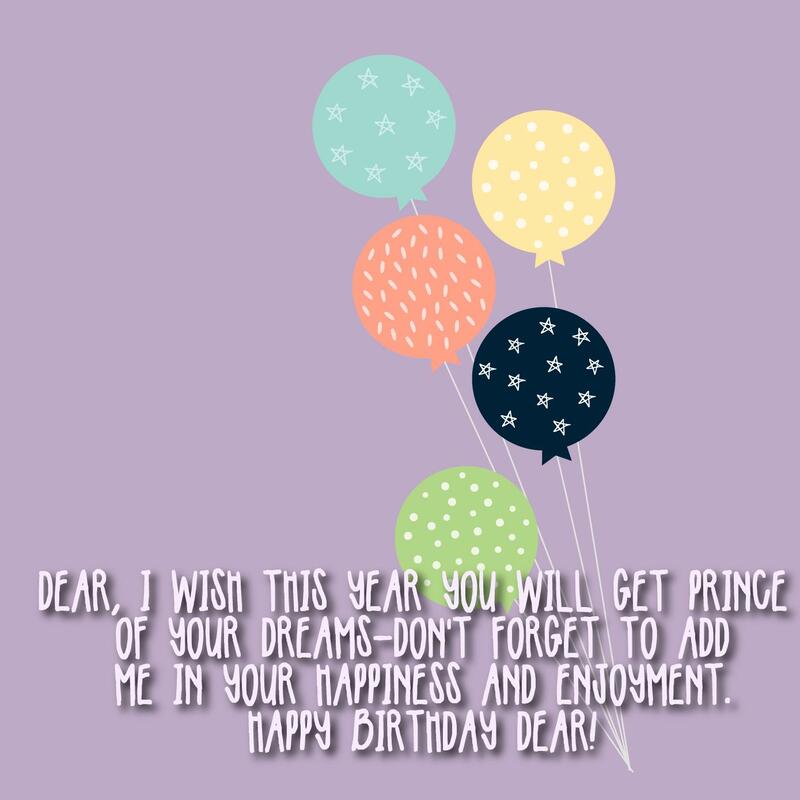 Happy birthday dear? My dear cousin sister! I have this to say to you- thank you for making this world a better place to live! This day is a great celebration for all of us because it’s the day that God sent you into our lives! Happy birthday sweetheart! In you, I’ve found a great friend, a number one supporter, and an awesome cousin sister! On your special day, I just wanted to wish you all the best in your endeavors in life. Happy birthday! My dear cousin sister, I’m sure you knew that you’re more than a cousin to me. You’re my motivation and inspiration as well. In fact, I wanted to grown up as successful as you! Happy birthday to you my beautiful cousin sister! I wanted to know how old you really are so as to avoid misunderstandings! Just kidding! Enjoy your day, my beautiful sis! On your special day today, I can remember one song – ‘forever young. Indeed, that is what you really are dear cousin sis – forever looking so young! Happy birthday to you! May God continue to bless you! Wishes may come and go but your age will definitely stay with you. Happy birthday to you my dear cousin sister! May all your dreams and wishes come true! Dear cousin sister, happy birthday! May this birthday of yours become the most amazing birthday celebration of your life! Please know that no matter what happens, we’re all here for you! That’s what family is, right? I’m sorry to know that you’ve already reached the age where you need to start to worry about the color of your hair! Happy birthday my dear cousin sis! I love you so much! Have a very marvelous birthday to you my dear cousin sister! You’re always going to be my best friend no matter how old we become! I love you so much! Have an awesome birthday my sister! For me, you’re always going to be my best friend in life. Thank you for always supporting me and protecting me in everything! I’m truly lucky to have you beside me. Happy birthday! Happy birthday to you, my lovely cousin sister! I hope your special day will be as great as you are! Please know that I will always be here for you no matter what! Happy birthday my dear cousin sister! I would not hesitate to say this but you’re my favorite cousin in the universe! I hope your birthday will bring you loads of happiness and love! My dear cousin sister! I’m truly honored to have such a great cousin like you. You have shared life lessons and advices that no others can give me. You’re truly a great inspiration to me. Happy birthday! Happy birthday to you, my beloved cousin sister! Thank you so much for guiding me through life and for always being there for me when I needed you the most! My dearest cousin sister! On this birthday of yours, I just wanted you to stay as optimistic and positive as you already are! You’re truly fantastic and I’m so glad that we treat each other as best friends! Happy birthday! Happy birthday to you my cousin sister! Of all the cousins I have, you’re the closest to me. So now that it’s your special day, let me take this opportunity to thank you for all that you’ve done for me. Cousin, you’re beautiful inside out and I thank God for sending you to my life. Thank you so much for all the great things you’ve done for me. I truly appreciate the care and the support! Happy birthday to you! Happy birthday to you, my beloved cousin sister! You’re certainly my favorite relative in the world! I’m so glad to have you in my life. I really love you so much. Happy birthday my sweet cousin sister! It’s time to get up because it’s your big day today. Let’s gather everyone around and organize a one big party! 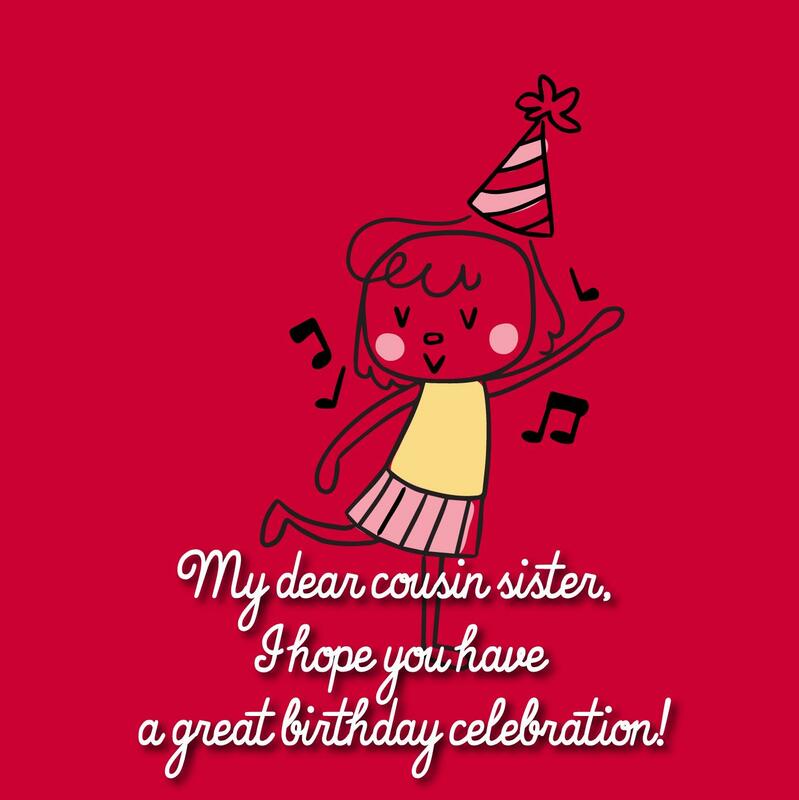 It’s your birthday today my dear cousin sister and I must say I’m so lucky that I have the best cousin in the world! I love you so much, sis! Happy birthday! My sweet cousin sister! May you have a blessed day today! Thank you for everything that you are to me. May we continue to share many more amazing memories together! Happy birthday sweetie! Happy birthday to you, my sweet cousin sister! You’re such a blessing to the family and I’m so happy that you happen to be my best friend as well. I love you so much my dear! Enjoy your day! My dear cousin sister, we’re so alike in so many ways! On your special day, I just wanted to wish you a very happy birthday. You’re so sweet and generous and I look up to you in so many ways. Thank you for being my inspiration. Happy birthday! Happy birthday my dear cousin sister! I just wanted to thank you for all the amazing things you’ve done for me. Everything that I am now is all because of you. Thank you for being an inspiration to me. Happy birthday to you, my beautiful cousin sister. Don’t be sad for adding another year into your life. You m ay be getting old, but you definitely look ten years younger than your actual age! Happy birthday to you, my cousin sister! I cannot wait to celebrate your birthday tonight! In fact, I’m excited to party and dance with you! Happy birthday to a dear cousin who’s also a best friend to me. Congratulations on reaching the age of maturity! For me, you’re still that little girl I use to play with when we were kids! Enjoy your day! Happiest birthday to you my lovely cousin sis! I just needed to know how old you are pretending to be so as to avoid any misunderstandings! Well, you know what I mean! Just kidding! Happy birthday to you, my darling cousin sister! Wishes may come and go but my love for you will remain the same! Please know that wherever life takes you, I’ll always be here for you! Cousin, you’re one of the best things that have ever happened to my life! I’m so happy that God allowed you to be my cousin and sister as well! Happy birthday cuz! I will always be here for you no matter what! Embarrassing moments, dark secrets, and meaningful silence. Indeed, we share so much more than merely genes! Happy birthday my darling cousin sis! Fate and destiny decided that we would be cousins. But we have proven them wrong by becoming best friends! Happy birthday to you my dear cousin sis! You’re truly the best cousin anyone can ever wish to have! Thank you so much for treating me like a real sister and for always being there for me when times are tough. Happy birthday cuz! A cousin is a best friend who is related to you by blood and a sibling who will not fight with you no matter what. I love you so much my dear cousin sister! You’re truly the best! Happy birthday! Who needs Google when you have a very smart cousin sister who can teach you everything in life? Happy birthday my dear! Thank you for your life lessons and guidance! My dear cousin sister, thank you for being with me through thick and thin. I can never imagine how miserable my life would have been if you’re not with me. Happy birthday sissy! Growing up, I’ve always wanted to have a best friend and a beautiful sister as well! I’m glad I got both in you! Thank you so much for being a great friend to me and for treating me like your real sister! Happy birthday! Some friends may betray you and your partner may cheat on you, but a cousin sister is someone who will remain loyal to you, no matter what! Happy birthday cousin sister! Destiny made a mistake for giving us different parents. However, it made up for its mistake by allowing us to grow into one family. Happy birthday cousin sis! I love you so much! The key to making my real siblings jealous is in spending more time with an awesome cousin like you. Happiest birthday to you, my dear cousin sis! Happy birthday dear cousin sis! You’re my antidote to an irritating friend, cheating boyfriend, and annoying boss! I’m really glad I have an awesome cousin like you in my life! Just like Father’s Day and Mother’s Day, I truly believe there should be a Cousin’s Day! That way, we can celebrate awesome cousins like you! Happy birthday! Sure, life has not given me good friends but it makes up by giving me awesome cousin who has everything I need for a best friend! Happy birthday to you my dear cousin sis! Dear cousin sis, sure, we’re related to each other by blood, but for me, we’re connected to each other through the heart. Happiest birthday to you sis! I love you so much! Even a real sibling won’t be able to fill in the shoes you have played in my life. You loved me unconditionally and protected me in everything. I love you so much! Happy birthday cousin sis! One of the biggest joys of being an only child that is that you get to appreciate having an awesome cousin like you in my life! Happy birthday sis! Thank you for being a great friend! Happy birthday dear cousin sis! I’ve already told mom and dad that if they’re going to give me a sibling, they should create someone who is exactly like you because you’re everything I want for a sister! Happy birthday my dear cousin sis! 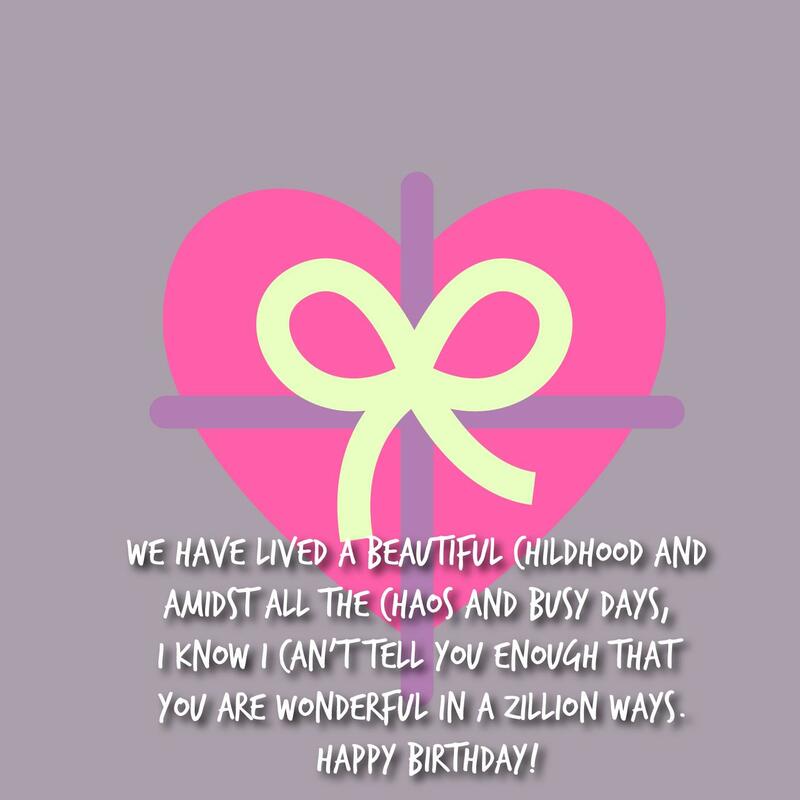 You may not be here now but please know that I always think of you especially now that you are celebrating your special day. I love you so much sweetie! May you have a blessed birthday! Perhaps, the reason why my parents did not think about giving me a sister is because they know that you are there and you would not mind taking care of me like your own sibling. Thank you for everything! Happy birthday cousin sis! Happy birthday cuz! You’re not just a cousin to me, but also a sister and a best friend as well! In fact, you have everything I need for a sister and a best friend. Enjoy your day sweetie! There’s no such word as cousin in my vocabulary. It is either a best friend or sister. Happy birthday to you my dear! Thank you for being there for me through thick and thin! Even if you are a daughter of my aunt, a beautiful person like you means more than just a cousin to me. You are my sister too! Happy birthday to you, my dear cousin sister! We may mingle and giggle during family gatherings but the best place that we have bonded in each other is in our hearts. Happy birthday to you, my dear cousin sister! You’re truly the best cousin anyone can ever wish to have. We might only be cousins, but in reality, we’re definitely so much more! You’re also a best friend and a sister as well. I love you so much my dearest cuz from the bottom of my heart! Happy birthday to you. You and me are meant to be cousins in the family, but becoming best friends is what we choose to be. Happy birthday my dear cousin sis! Thank you for everything you’ve done for me. Happiest birthday to a family member whom I’m proud to treat as my best friend as well. Enjoy your special day cousin sis! Happy birthday to you, my dearest cousin sister! It’s your special day today. So let’s go crazy and enjoy your party! I cannot wait to see what life brings to us in the coming years! Happy birthday to you my dearest cousin sis! For me, you’re perfect – smart, beautiful, funny, and sweet! I guess the reason why we go well together is because we’re so much alike! Happy birthday to you my dear cousin sis! I’m really proud to have you in the family. With you, I found a best friend, a cheerleader, a confidante, and a mentor. Thank you for everything! You’re truly the best! Happy birthday to you my darling cousin sis! Thank you so much for being so good to me. You don’t only treat me like a cousin but a best friend as well! Happy birthday cousin sis! Let’s let the good times roll today because it’s your birthday. I wish I were there to celebrate this special day with you. But even if I’m far, you’re always in my heart! Happiest birthday my cousin sister! I just want to wish you all the best in life! You truly deserve to have all the best in the world because you make the people around you feel blessed! Happy birthday my cousin sis! I can’t imagine where my life would have taken me if you were not beside me. Indeed, life has been so amazing since you came. Enjoy y our day sissy! Happiest birthday to you my dear cousin sis! No one understands me quite like you. We both are crazy, beautiful, naughty, and smart! I definitely will not trade our memories for anything in the world! Happy birthday to you my dear cousin sis! You’re truly the best person to be around. You are funny, smart, and gregarious! That’s why I love to be with you always. Happiest birthday my dear cousin sis! If there’s one word that I can use to describe you, it is REMARKABLE! You’re truly a remarkable woman with infinite talent. Have a great day to you sweetie! Happy birthday cuz! You’re one of those classiest gals I know! You are full of confidence and you handle everything with ease! You truly inspire me and I hope you’ll stay that way! Happiest birthday to my spectacular cousin! Hope you will have the best day of your life because you truly deserve all the happiness that this life brings! I love you so much sweetheart! Happy birthday cuz! I’m sending you festive balloons and lots of cakes on your way so you can fully enjoy your big day! I miss you so much! Happy birthday my dear cousin sis! Wishing you all the spectacular things in life and I hope you’ll enjoy more success and blessings in the years to come! Enjoy your day! Happiest birthday to you my dear cousin sis! You inspire us to do great things in life and I truly appreciate that. Hoping you’ll have a really great day today! Happy birthday cousin sister! We share a lot of great memories since childhood. I truly enjoyed spending time with you and I promise to cherish our memories forever! Happy birthday cuz! 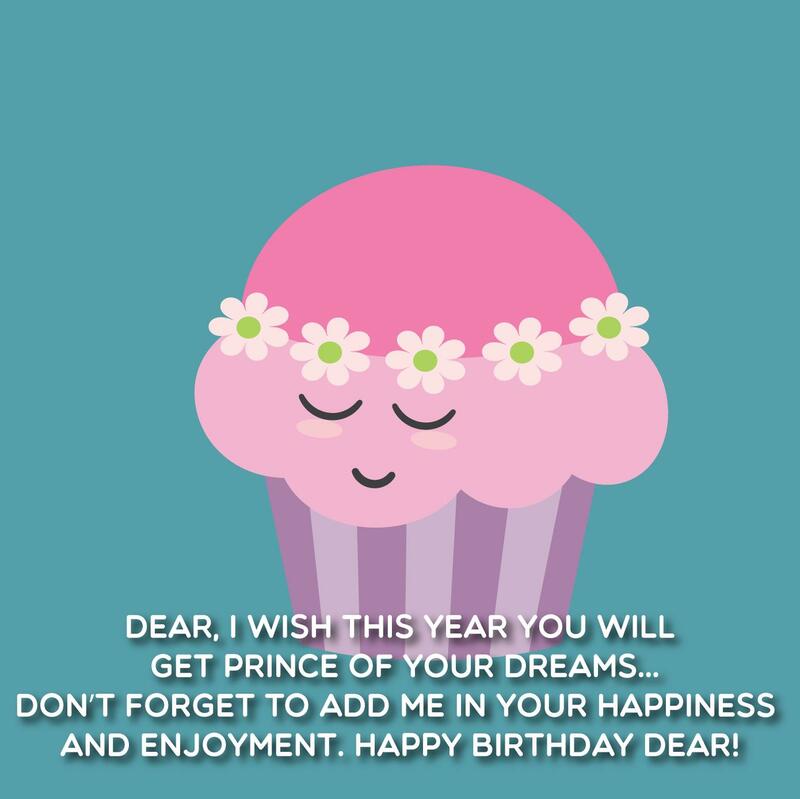 I’m sending you lots of happiness your way and may you enjoy this very special day because you truly deserve to be happy! Happiest birthday to you my cousin sister! I wanted to send special wishes to you and a truly exceptional awesome year filled with lots of blessings and success! Enjoy your day!